Place the banana pulp, oats and plant milk into a bowl and mix well. To make these oil -free, you'll need a really good non-stick saucepan and use over a high heat. If using oil, just go for a light spray. Place about half a cup of batter in the pan and let cook for 1-2 minutes (or golden brown on the bottom) before flipping. Remove from pan once golden on both sides. Repeat until you have used up all the batter. 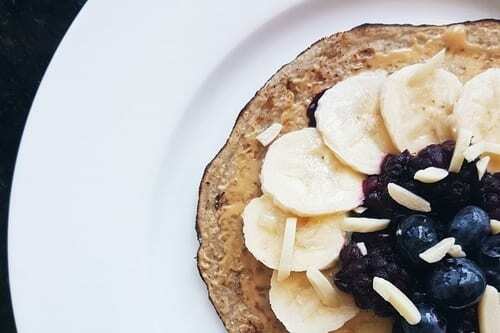 Spread a thin layer of peanut butter on each pancake, about a teaspoon or so, then top with sliced banana, berries and a sprinkling of silvered almonds.